Royal China - the romantic dimsum affair - CHOMP! SLURRP! BURP! Royal China sits on the sixteenth floor emits opulence and romance with a picturesque view of the Lotus Temple. Step out of the elevator and you are in for nothing less than a royal treat. The fine dine restaurant is immaculate with finely dressed tables, a drop dead gorgeous view and a very peaceful aura. Royal China takes pride in their dimsum spread and there are no two ways about it. Served in traditional bamboo baskets, the dimsums are hand crafted piece of art. We tried an extensive spread ranging from vegetarian favourites – sui mai, vegetable chive, crystal dumpling, and meaty stuff – prawn dumpling, prawn and chive, chicken and chive, pork dumplings and soup dimsums. The USP is that the dumplings are super effing fresh. They probably have a secret garden stashed into their kitchen, because the vegetables have a magical crunch and freshness setting the dimsums apart. Vegetables salt and pepper and DIY lettuce wraps – crunchy fresh vegetables (oh yes, the same freshness as the dimsums) battered and tossed with garlic julienne and spring onions. The DIY lettuce wraps were most novel – thick lettuce leaves, sweet corn, carrots, beans concocted together and topped with some sticky hoisin sauce. Delicious! For the mains – fish in black bean sauce, black mushroom and stir fried greens and noodles. Like traditional Chinese mains, the dishes didn’t have runny gravy best just enough for condiments. The fresh, crunchy vegetables and the crisp fish in black bean sauce and flavorsome noodles. 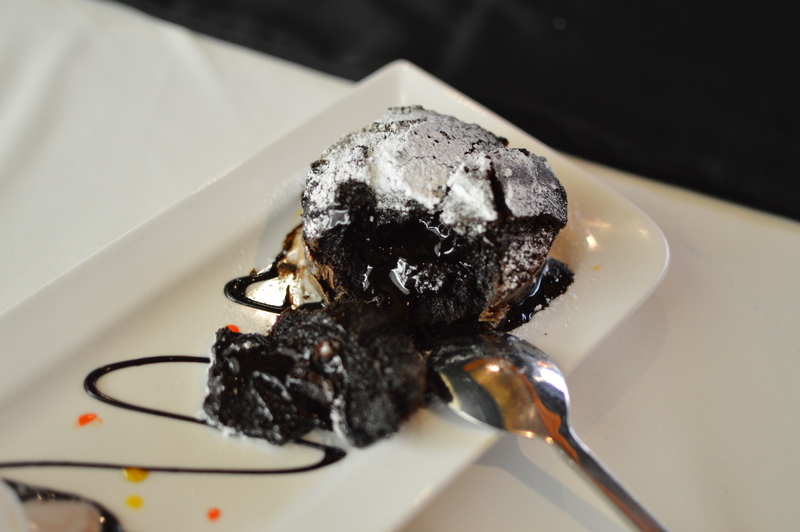 We wound up the meal with molten chocolate cake – a sinful preparation with molten chocolate topped with castor sugar and ice cream. So delish. Perfect for a romantic soiree or a cozy brunch, Royal China is the place to be for sharp and authentic Chinese.